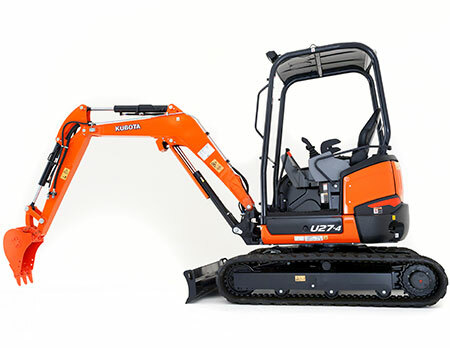 The U27-4 is designed to handle the challenging jobs that are way out of reach for bigger excavators. The zero-tail swing lets you travel through and turn smoothly in tight spaces with ease. 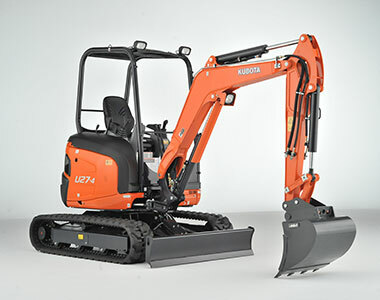 And features like a powerful digging force and easy simultaneous operation of four functions and more, offer performance you can truly rely on. 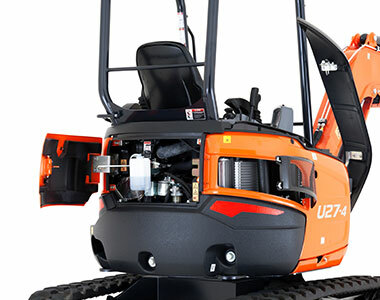 Powered by a Kubota 20.8HP engine for reliability and to maximise digging and lifting performance. Powerful bucket digging force with a well balanced arm and bucket to allow for faster, deeper (2820mm) and efficient digging in the toughest of conditions. Simultaneous operation of the boom, arm, bucket and swivel is controlled with two variable pumps to distribute an accurate amount of oil flow to each actuator to allow for high performance digging and dozing. Easy maintenance as the engine is organised with easy access to the radiator and engine oil cooler. Protected cylinder hoses located inside the boom to minimise damage. Travel lock system to lock tracks and secure machine by preventing movement during transport or parking. Standard AUX1 & AUX2 to further increase machine versatilty. A convenient thumb-operated switch on the lever allows for easy flow control of the auxiliary circuit. Rocker switch located on lever for easy switching between AUX2 and Swing function. Adjustable oil flow control dial mounted on top of meter panel to allow easy control for the operator. 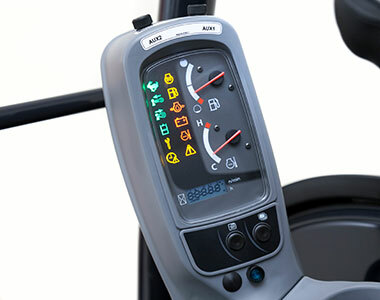 TPSS Two-Pattern Selection System positioned under the seat which allows the operator to switch between ISO and SAE pattern. Deluxe interior with spacious flat foot space to enhance comfort with more leg room for the operator. New user friendly digital panel positioned for better visibility and convenience at your fingertips featuring an easy one touch button operation. 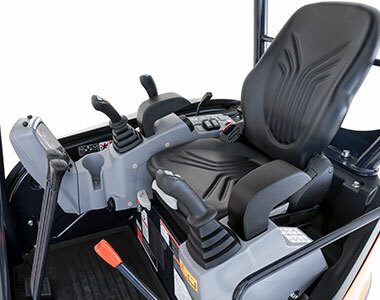 Suspension seat designed for better fit and operator comfort to minimise fatigue for long hours of work.